Lettering is also available in Black and Pink, if requested. The photo merely represents one of the featured styles. 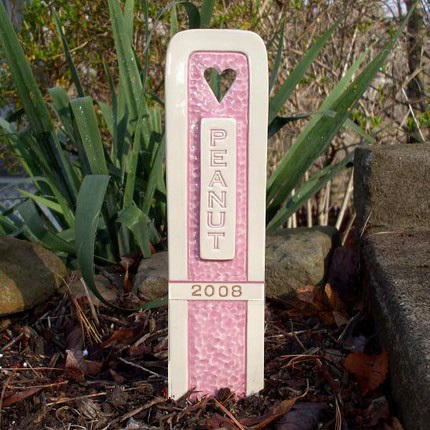 This simple yet distinctive ceramic marker is handmade of high-fired, Creme colored stoneware. Featuring a clear glazed surface for endurance and easy cleaning. 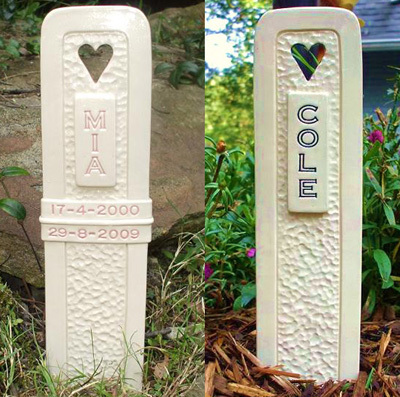 You choose the Pet's name to be stamped into the clay AND the design, HEART, STAR or CROSS that is cut-out at the top of the marker; (Simply send a message with your Pay Pal payment with this information after purchase).